Spotify is coming to the car dashboard - it's making sweet music with Ford Sync allowing you to play music through the car's stereo system without any wires. 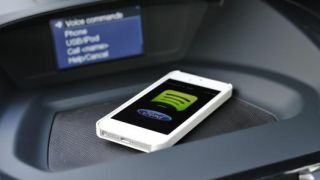 It's one of the first major musical partnerships for Ford since it launched the Sync Applink developer programme at CES 2013. Update: Unfortunately, the Spotification of the car is moving at glacial pace: Ford told us that it's only bringing the new functionality to new cars so existing Ford owners won't be getting in on the action just yet. The new features will only work in cars with Sync and Applink - in Europe, that means literally no Fords that are already on the market, only the car Ford launched today fits the bill. So only brand-new Ford-owning Spotify-subscribing smartphone users can listen to Spotify without cluttering the front seat with any pesky wires or needing to take their hands off the wheel or eyes off the road. Ford did add that it's working on making it available to older cars but was very sketchy on details so we imagine it's still a way off. You'll be able to control the app through the car dashboard using simple voice commands to adjust the volume and access things like top playlists, your music library, similar music, starred songs and radio stations. It's coming to compatible Ford cars in the US and Europe in the coming weeks. You may want to consider listening to offline playlists if you're planning to drive through many tunnels though - and an unlimited data plan might come in handy for those long-haul drives too. Update: we've been having a play with Spotify in Ford Sync, so check out our first look!